That being said, I've begun making outline sets on MHAG which can be found under the search button, and by typing "<Outline Set>" under the Set Name space. I've only begun the process, and as such, I have only placed 4 outline sets so far. If there are any [very] obvious ones I missed, feel free to point them out, and I will be glad to post them when possible. Because no one else has used the "<Outline Set> name in any of there sets, feel free to post any of your own outline sets yourself to claim credit for them. Please note that if you abuse the "<Outline Set>" name, I will have to list reliable names to look for while browsing mhag in this blog. Current List of Outline Sets. Feel free to provide any more combinations that you are aware of, and good luck mixing! Yes! A good day for monster hunter fans!! 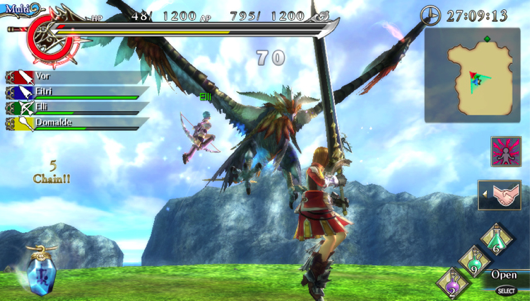 Ragnarok Odyssey was just announced to be localized for PS Vita! This game looks absurdly similar to monster hunter games. It comes with online support and amazing graphics on Vita. Can't wait to play the game! Check the following link for more details.